PRWeek EU Referendum Panel: The two sides have picked their top-line messages ahead of Thursday's vote, and 'remain' supporter Gill Morris considers which will prevail. There's no denying that both the Bremain and Brexit camps had had their shredded wheat before the Great Debate on the BBC on Tuesday night. After a campaign pause to reflect on the tragic murder of Jo Cox MP and the politics of hate that killed her, the gloves came off as Remainians and Brexiters desperately fought their corner. But are we any less confused by what each are saying other than "take back control" ad nauseam for camp Brexit and "don't risk it" for camp Bremain? The idea that the UK has no control over our health service or economy because we are in the EU is, of course, nonsense. Let us not forget that we live in a democracy with independence, power and control and are not actually governed by Europe. But is the "control" message perhaps stronger and more appealing than "don't risk it"? Don't risk your job, your home, your children's future work. Don't risk the economy, your rights and our national security also work as messages, but it is when the "take control" message is applied to immigration that the "don't risk it" message begins to flail. The benefits of European freedom of movement are undeniable and we are a richer and stronger country for it, but how many voters will be swayed by Brexit's "take back control" message and the promise of an Australian points system? Evidence of hate and fear have soured the campaign but perhaps the "take back control" message also flails against the overwhelming body of evidence and support to 'remain' received from top economists, scientists, world leaders, business leaders, security chiefs and even, yes, David Beckham. The "don't risk it" message could win through though if undecided voters accept that the UK is not out of control, and that we are better off inside the tent. 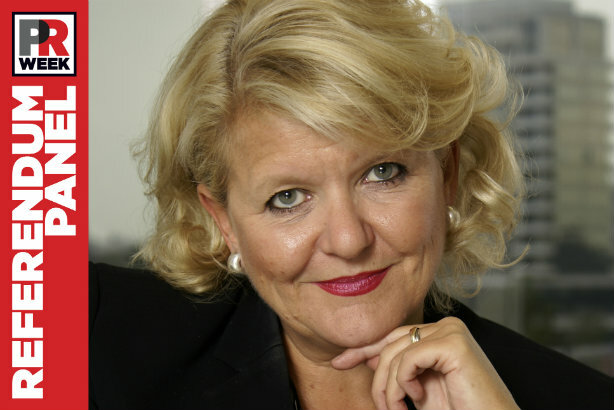 Gill Morris is chief executive of DevoConnect and is pro-'remain'. We're all tired of this spectacle, so will it be the weather that decides the EU vote? Could a pro-Brexit press take 'leave' over the line in Thursday's referendum? The Independent Group - what are the consequences for public affairs practitioners?